During this new year season I am reminded of the special privilege of spending a final semester with our amazing Class of 2019. While the class is comparatively smaller than last year’s graduates, they have a vibrant and healthy class culture and it has been a blessing to watch them mature and grow in stature and faith since 10th grade when I first arrived at BAIS. Our community is proud of them! This is the season for seniors to begin hearing back from the universities they have applied to for early decision or early action. Although it is early, students have already been accepted to University of Michigan, University of Wisconsin-Madison, Sheffield Hallum, Lancaster University, National Taiwan University of Science and Technology, and National Cheng Kung University. Please see the lobby TV for updated information as new results come in! Please also be in continued prayer for these students while they celebrate good news and grieve disappointment. Please pray that they can rest assured in God’s perfect plan for them and prayers that we can support and love our student in times of plenty and times of wanting. This semester is when BAIS begins to deliberately train and mentor our seniors through the RAFTing process. RAFT is a deliberate process leading to healthy transitions from one community or home to another. Many of our students will transition from Indonesia to a completely new culture and we want to prepare them well! T – Think destination – making plans to connect with their future community and making plans to stay connected with family and friends being left behind. Pray for our school and for our seniors that this process will be effective and healthy for them and that this transition will be a springboard into quick and positive adjustments to all-things-new while they prepare their hearts and minds for leaving BAIS and entering the next beautiful chapter of their lives. Congratulations to Haram Jeong & Kirstie Ko! Make sure to congratulate them both when you see them around campus. Also, please be praying for the other students in the senior class as they are in the process of applying or are waiting for the decisions to be announced. If you have any extra PE uniforms or old PE uniforms that your child has outgrown, we would love you to consider donating them. Kindergarten and First Grade classrooms are in need of extra clothes to fit the younger students. These are used when in a variety of ways when a student needs an emergency change of clothes. We thank you for your help with this. Please bring any donations to the First Grade classroom. Why have we joined an activities conference? BAIS is very proud and excited about our participation in the Bandung Activities Conference (BAC) that has been founded this year thanks to the efforts of Mr. Powers and Ibu Dias. Member schools include BAIS, Bandung Independent School, CBCS, Stamford, and Trimulia. BAIS celebrates engaging students in their learning beyond the four walls of the classroom leading to education of the whole child. Membership in this conference will improve our ability to accomplish our mission! This year, the conference activities are basketball, and badminton. Next year, soccer will be added along with hopes to include a music festival, Model United Nations, and other academic competitions. The library is in the process of updating our library materials. During this time we are taking out many books that we no longer need and we will be replacing them with new copies or new titles. In light of the process, we will be putting some of our books in our FREE BOOK Shelf. So, come visit the library and get some free books! We are also looking for other public or private libraries where we can donate books. Feel free to contact us at johnratukado@baisedu.org or yofianapatty@baisedu.org. BAIS basketball game TODAY against CBCS at BAIS. Boys start at 4; girls follow. 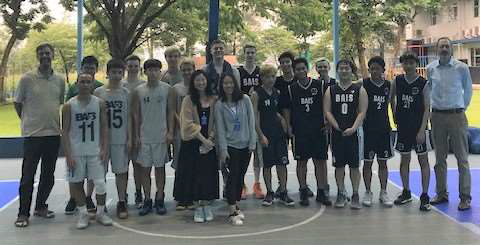 Thanks to the visiting BAIS alumni for playing against and speaking to the BAIS basketball team. It was great to see each of you back on campus! Please let us know if you have any suggestions, particularly if you know of a ministry or charitable organization in the Bandung area which BAIS could help during WWW. Please send suggestions, contacts, ideas (crazy or otherwise) to Mr. Whitehurst and/or Ms.Ribbens.